5 Tips to help businesses say “Bye Bye to Bad Wi-Fi”. Including a tip that 9 out of 10 UK SMBs don’t know about. Joni Mitchell may not have been singing about Wi-Fi when she wrote, “Don’t it always seem to go, that you don’t know what you’ve got till it’s gone,” but the sentiment certainly applies to wireless internet access. When your Wi-Fi is working well, you don’t think about it, but when the performance or connection drops, its absence is quickly felt. Sadly, the dream of uninterrupted Wi-Fi is one that few businesses experience. In fact, in a recent survey of 1,000 UK businesses by NETGEAR, 89% said they had experienced at least one problem with their Wi-Fi system that meant they couldn’t meet business needs. This included slow connections (38%), coverage problems (18%), dropped connections (33%) and more. 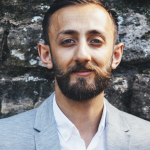 As a small business owner, these are likely to be issues that you identify with, which means you could also be among the 87% of UK businesses that were unaware of a solution that could mean saying “bye bye” to their bad Wi-Fi; namely mesh technology. A mesh Wi-Fi system, such as the NETGEAR Orbi Pro, uses a router and one or more satellites to extend high-speed Wi-Fi coverage to the far reaches of your office. The Orbi Pro router and Orbi satellite transfer data to one another via a dedicated high-throughput wireless backhaul using patented Fastlane3 technology, creating a Wi-Fi blanket that covers up to 10,000 square feet with high-performance AC3000 (3Gbps) Wi-Fi. 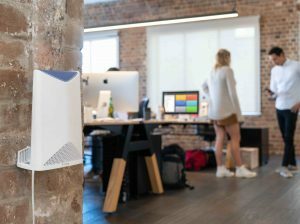 Employees and customers simply connect to the Orbi Pro router or Orbi satellite that offers the strongest signal; this is seamless and all happens automatically, ensuring everyone has fast, reliable access, no matter where in the office they are working. You could even extend Wi-Fi to communal spaces, such as gardens or terraces to provide a range of working environments, or to allow people to check Facebook while they’re on a coffee break. However, a good Wi-Fi connection isn’t only important for your staff, because 82% of survey respondents said it was important for their business to offer customers a good Wi-Fi connection too. The business case for doing so is clear, with 52% going on to say they relied on Wi-Fi for customer retention. This alone is compelling, but the survey presented further evidence of the business benefits of customer Wi-Fi. This included 16% saying it increased footfall and 24% indicating that customers spent more time on the premises as a result of offering good Wi-Fi. Furthermore, 32% said that Wi-Fi was important for attracting new customers and 70% said that Wi-Fi was important for improving customer service. Whether it’s for staff or for customers, the business importance of reliable, high-performance Wi-Fi is clear. 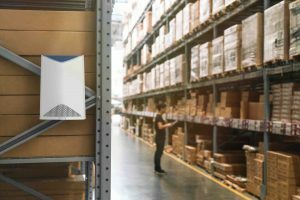 So, if you’re one of the 9 out of 10 UK businesses that needs to say “Bye Bye to Bad Wi-Fi”, a NETGEAR Orbi Pro mesh Wi-Fi system could be the solution you’re looking for. If Joni Mitchell had been singing about mesh Wi-Fi instead of environmental concerns, she might have said, “Don’t it always seem to go, that you don’t know what you’ve got if you never had it in the first place.” But then she probably wouldn’t have had a hit record. Check us out to learn more about the Netgear Orbi Pro. It’s likely that some locations in your office or business premises will have a weaker Wi-Fi signal than others, and possibly some areas may have no signal at all (a dead spot). A full Wi-Fi site-survey will reveal these problem spots, but small businesses can also use tools such as the NETGEAR WiFi Analytics app to locate areas with poor signal strength or crowded Wi-Fi channels. You can use this data to place a Wi-Fi mesh extender or NETGEAR Orbi Pro mesh Wi-Fi System, to extend signals to all areas of your office. As hinted above, the placement of your Wi-Fi router can dramatically affect the strength of the coverage in different areas of the business, so the location of your router and satellites needs careful consideration. Avoid corners and windows, which will mean a large percentage of the signal is absorbed or beamed out into open space, and avoid placement inside cupboards, especially metal cupboards, as this will seriously reduce signal strength. Instead aim for a central placement or ceiling location, so that the signal is not obstructed or wasted in areas where your workers are not located. You can even strategically place an Orbi Satellite to provide coverage to a customer area to ensure a good signal. Network admins, employees and customers all need different levels of access, so separate your Wi-Fi networks into admin (owner), employee and guest networks. Even better, create a guest portal to offer customers free Wi-Fi internet, without allowing them access to the rest of your network. This also provides marketing opportunities, such as immediately re-directing customers to webpages with deals or offers. Regularly check and update your router’s firmware to ensure your device is protected against recent vulnerabilities that could threaten your network’s security. Also, ensure your Wi-Fi networks use the stronger WPA or WPA2 security protocols and avoid the more easily hackable WEP standard. Congestion and interference can be a major problem if all of your employees connect to a 2.4GHz Wi-Fi network. This is especially the case if neighbouring businesses are also using 2.4GHz networks, which may be operating on channels that overlap with the one used by your router. Upgrading to 802.11ac or better Wi-Fi, and ensuring features such as MU-MIMO and Beamforming are enabled on your router will lead to faster speeds and less congestion. Another benefit is that if all your staff can use the 5GHz band then you can dedicate the more widely compatible 2.4GHz network solely for customer Wi-Fi, helping to ensure an optimal experience.